When you come to The Church At Carrollton, you will find a loving atmosphere where people are encouraged, and the saints are equipped and engaged into a deeper walk with Christ into the Kingdom of God. In Romans 14:17, we find, “For the kingdom of God is not meat and drink, but righteousness, and peace, and joy in the Holy Ghost.” Pastor Greg teaches us about the Kingdom of God and that it is within us. Don't let misconceptions keep you from being blessed. Many times, we let other things stand in our way of truly being blessed. Listed below are some common misconceptions that people have which stop them from attending a worship service. We want you to be at ease when you come to worship with us, so don't let these excuses stand in the way of your blessing. I will not know where to go when I get there? 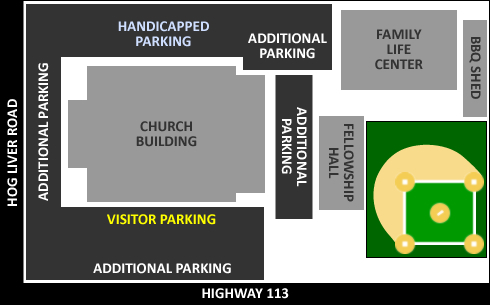 The diagram below should help you navigate around our church campus. Should you need further help, enter the church building, and people will greet you and help you find your way. Because I am visiting, attention will be called to me and I'll be labeled as a visitor. We want you to feel welcome, and we definitely will not ask you to stand up, raise your hand, or say anything to make you feel uncomfortable. Our desire is that you will feel like family and that your spiritual needs will be met while you are with us for worship. I will feel out of place. Of course, it is intimidating to walk in somewhere new and unfamiliar, whether it be a church, a restaurant, a school, an airport, etc. If you have a question, please ask someone for help. We want you to feel at home at The Church at Carrollton, and are willing to help you in any way we can. Our prayer is that you will feel like family before you leave. I just want to watch at first, but I know they will try to get me involved or sign me up for something. Being pressured to do something is an unpleasant experience for anyone, especially in a group of unfamiliar people. We will not pressure you into joining our church or involvement in ways that you do not desire. We come together to worship God in spirit and in truth as a body of believers, and we invite you to worship with us. While you would be a welcomed guest, our most precious and coveted guest is the Holy Spirit, and we do not want to disrupt His presence by pressuring you. People will judge me if I don't want to use the church child care and my children get noisy. Children are a special blessing, and we invite you to keep them with you during worship, if you so desire. The age of our congregation ranges from tiny to ninety, and we are delighted to have your family worship with us. We do offer child care for children birth through two years of age, and each week we pack individual worship bags for children ages 3-12 for use during worship each week. The bags are labeled with the child's name and contain snacks, children's bulletins, coloring activities, crayons, and other small gifts. The children remove everything from their bag to take home with them after worship (except for their crayons) and the bag is repacked for the next week. If you are nursing, need a place to change your child, or your child needs some space to play, we also have a room where you may sit with your children and watch the sermon on a television. Our church family is made up of a variety of people, some who have more knowledge of the Bible than others. We do not want you to feel that you have to be a Bible scholar to study with us as we are all on a journey of digging deeper into God's Word to learn and grow in our relationship with Him. Bible study groups meet on Sundays at 10:00 am and other times as noted in the church calendar. We would be delighted for you to join us for Bible study. I don’t have anything appropriate to wear. Those who worship at The Church At Carrollton dress in a variety of styles. At any service, you may see sneakers and heels, jeans and dresses, golf shirts and ties. Our desire is that your focus be on worship, not on a dress code. To us, dress is a personal matter of worship before God. One person may dress casually and rejoice that our gracious Lord accepts us as we are, while another may dress to reflect the majesty and wonder we have for Jesus Christ, our Lord and Savior. When a person dresses out of love and adoration for his or her Lord, the choice of dress, be it casual or more formal, is acceptable to God and to us.